Jack Hanson came off the bench to help spark 11th-seeded Madison upset No. 6 Rutherford, 63-53, in the opening round of the North 2, Group 2 state sectional tournament. RUTHERFORD – The beauty of the state tournament is that whether a team is state title favorite or one that finished the season well off the pace in its own league, every team gets to start over with a clean slate. In the case of Madison, which finished the regular season with a .500 record, the 11th-seeded Dodgers entered the postseason with nothing to lose. Playing loose and without any pressure, they picked a good time to put together their best effort of the season. Jack Hanson sparked a first half run and Madison never looked back. Teammates Andy Christos and Santi Quintero both made big plays down the stretch as the Dodgers pulled a 63-53 upset over No. 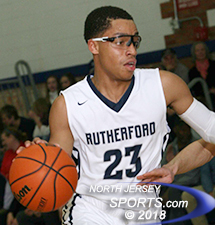 6 Rutherford in the first round of the North 2, Group 2 state tournament on Tuesday night in Rutherford. 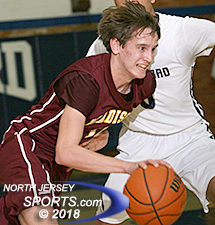 Rutherford never led at any point in the game but did tie it at 7 late in the first quarter on a three-pointer by Nick Nunziato. Hanson, Madison’s junior guard, came into the game and made his presence felt immediately. On his first five touches spanning the first and second quarters he hit a jumper, a three-pointer, a floater from the baseline and dished off two assists. He accounted for 12 points in a 14-4 that helped the Dodgers take control en route to a 29-16 halftime lead. Breylyn Jones led the way with 21 points for Rutherford, which finished the season with an 18-9 record. Rutherford played like a desperate team in the third quarter and got back in the game by crashing the offensive glass. A pair of offensive rebounds turned into threes by Breylyn Jones and Johnny Mendez as the Bulldogs whittled the lead down to four heading into the fourth quarter, 35-31. The Dodgers never lost their composure thanks in large part to point guard Santi Quintero successfully navigating Rutherford’s 1-3-1 full-court pressure. That led to scoring opportunities for Christos and the junior forward delivered. He had seven points in a 9-3 burst that bumped the lead back up to double-digits. Rutherford kept battling and got the lead down to six with just over three minutes. Hanson came up clutch again in a big spot with a corner three-pointer to make it 49-40. Quintero nailed four straight free throws and Christos followed with two more to ice the game and send the Dodgers into the quarterfinal round. Andy Christos and Madison will visit Newark Central in the quarterfinals. 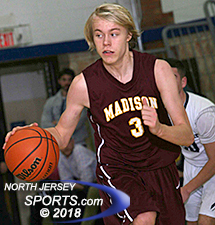 Christos dropped a game-high 22 points for Madison (13-12). Quintero added 13 points and five assists. Hanson finished with 11 points and Ian Magnani chipped in with 10. The Dodgers will take on third-seeded Newark Central in the North 2 Group 2 quarterfinals on Thursday. Jones led the way with 21 points for Rutherford, who finished the season with an 18-9 record. Last night marked the end for Rutherford. For the Dodgers, they hope it is just the beginning of an upset-laden run through the states.